Recently, my wife and I visited Northern Ireland for a holiday. We rented a small cottage on a farm where they stable horses, give riding lessons and teach show jumping. The setting was I lovely. Looking out of the French doors to the sea only a couple of miles away. Driving the narrow and winding roads of the countryside and coastal roads, one understands the beauty of this place. From the Giants causeway, to Torr Head, to the mighty Slemish mountain the ruggedness and antiquity of this isle breathes into ones imagination a vision of hardship and strife. But Eire is know as a ‘green land ‘ and it is true that as one flies over this island that field after field is a varied shade of emerald, the Emerald Isle. 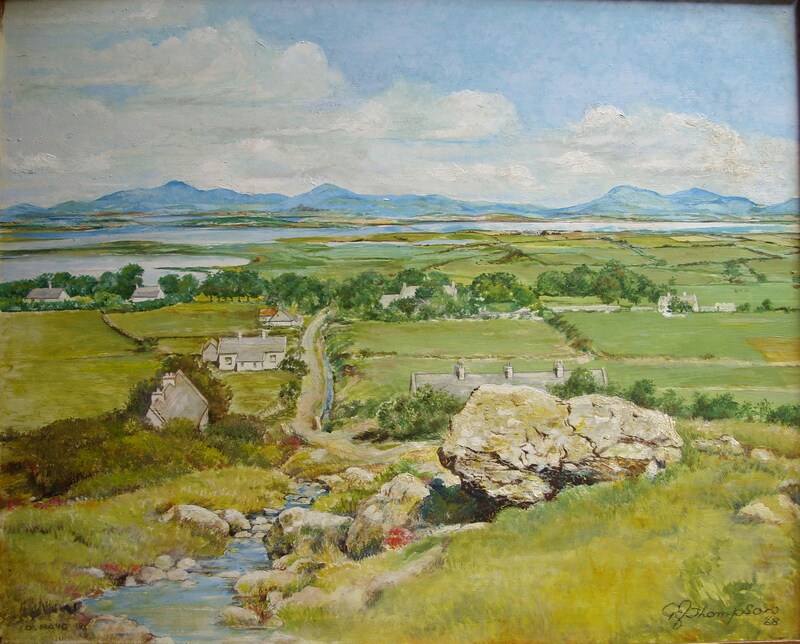 This green and pleasant land can be seen in this oil painting by G S Thompson. From rolling hill and gurgling stream, down to the sea on dusty road and beyond to the haze shrouded mountains, this place has been touched by God. A serenity, a beauty, a ruggedness filled with life born of labour and strife. This isles history tells of struggle and conflict, of victory and success, of feast and famine, of departing and returning. It invites and entices and does not disappoint. Come enjoy an Ulster fry, a Guiness, some soda bread, a colcannon, a slice barmbrack followed by a Bushmills. This is Ireland. The above oil painting is something I thought you might just like to look at. I know nothing about this painting for it is unsigned and undated. It is painted on canvas which has been mounted on board. It is lovely to look at. 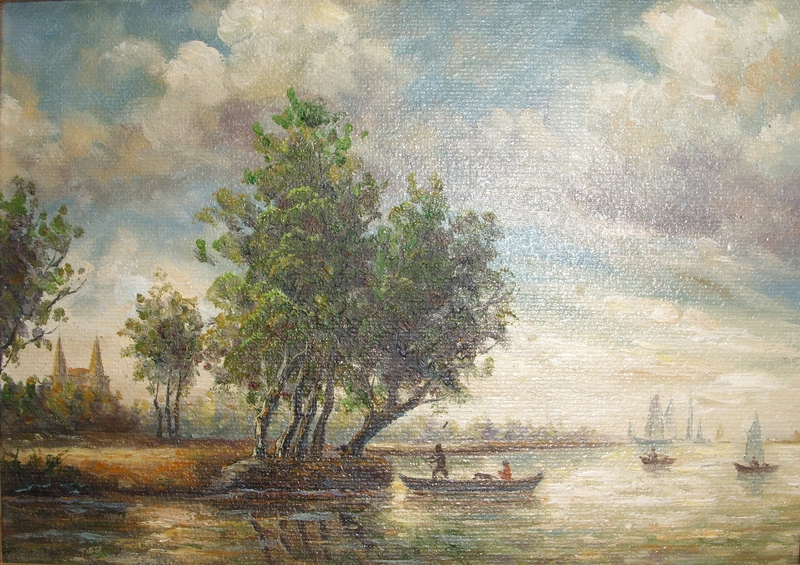 It is somewhat Constable-esque in its’ use of colour and the scene it portrays. I hope you enjoy. It differs from the first painting which measures a goodly 17″ by 21″ while the second is a meagre 5″ by 7″. One done with what one might consider a regular size brush while the other done with a very fine brush indeed. Enjoy. This entry was posted in Oil Paintings and tagged boats, church, fields, Ireland, road mountain, rocks, ships, shore, stream, trees. Bookmark the permalink.